Quincy Preserves invites you to attend a special extra tour this holiday season – a Christmas Altar Crawl – on Sunday, December 2, 2018, from 1:00 to 5:00 pm. This holiday tour will feature six of Quincy’s magnificent churches located in The District. In addition, the History Museum on the square will be open for tours of their incredible collection of stained-glass windows. Two talented stained-glass artists will be available throughout the afternoon to demonstrate techniques and answer questions. 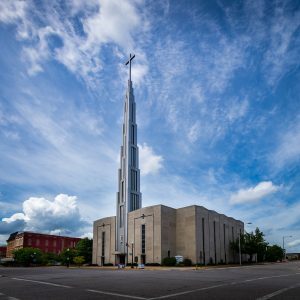 Each sanctuary and chapel seem to present a grander vision of the architects’ goal of “reaching toward the heavens” and to immerse their congregations in holy light through the use of color in magnificent stained-glass windows. 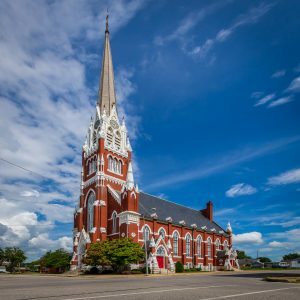 You will see two original Tiffany windows, Quincy’s only Carillon, a chapel where the windows represent the Lord’s Prayer, and a German Bible gifted from Kaiser Wilhelm in the 19th Century. Two other churches will present you with nearly wall-size panels of stained glass; one of Martin Luther at Wurtemburg and the other in a Neo-Gothic sanctuary. The only modern structure on the tour is of Benya design and creates the feeling of a very large expanse with a certain closeness to the Altar. Tickets are $12 in advance [PURCHASE TICKETS] and $15 the day of the tour. Tickets may be purchased in advance at Kirlin’s Hallmark in the Quincy Mall, Adam’s Florist at 522 S. 8th Street, Domestics Etc. at 119 N. 6th Street, and Emerald City Jewelers at 3236 Broadway or online. Tickets may also be purchased on the day of the tour at any location or via credit card at Central Baptist Church. The mission of the Quincy Preserves, Inc., is to foster awareness of and to promote appreciation of the historic architecture of Quincy, Illinois, and Adams County and to encourage active membership involvement in the recognizing, protecting, maintaining, and displaying of these structures. Your attendance at these events gives you the opportunity to see inside some of Quincy’s finest places and support the Preserves programs of plaque recognition, scholarships, and residential and commercial facade programs.